I'll start off by mentioning that the preface of the revised NAB NT is clear in that it follows a formal equivalence translation philosophy. The original NAB NT was certainly more on the dynamic end. I have read reviews and criticisms on forums and other blogs that disliked the NAB because it was a dynamic equivalence translation, but that does not seem to be the case from this preface. (The occasional odd rendering in the OT and the lackluster revised Psalms probably contributed to that belief.). From my perspective, the Revised NAB NT is fairly literal, somewhat slightly less than the RSV. In comparison with the NRSV, I think it is pretty close with a slight edge to the NAB. I'll give some reasons why I think this in a future post. I like the points that were addressed preface. If I'm reading the lines correctly, then it seems like it will be the perfect book for those that feels that inclusive language should be included at some points in the Bible, but doesn't like the amount found in NRSV. I like the issues that they focused on. The only thing left might be to see if they properly address the problem people have with the notes found in NAB. The preface for the NT was done in 1986, but all indications are that the NABRE will follow those guidelines and presumably Liturgicam Authenticam. We shall see. I think that there is no doubt that there will be some inclusive language used in the new translation of the O.T. I am ok with that if done properly, only translating those words that were most likely inclusive to begin with. But I would object to the changing of the singular into plural to squeeze in inclusive language where it does not work with English, (that is what notes are for). I wonder what will be done about some of the verse re-ordering that was done in some of the prophetic books of the O.T.? And I hope for more abundant notes in the O.T. I think Mary Sperry answered, earlier in the year, that there would be fewer reordering of texts and more abundant OT notes. As for the inclusive language issue, that we will just have to wait and see. If you look at the new Grail Psalter, they do translate Psalm 1 "Blessed indeed is the man" which would indicate acceptance of the norms if Liturgian Authenticam. We shall see if the NAB follows this as well. I was curious about Liturgicam Authenticam. Do you know if it's going to be followed to the letter or only somewhat like the RSV-2CE? Not sure. The USCCB hasn't released any sample texts as of yet. I am hoping for some news in January. If the NABRE will follow Liturgicam Authenticam, then wouldn't it use the altered NT approved for Mass? That is the version of the NT that follows LA, not the standard 1986 NT. So far, all signs point to the 86 NT being used, and I just don't understand it. The altered Liturgical NT is the newest revision, and it is the one that follows LA. 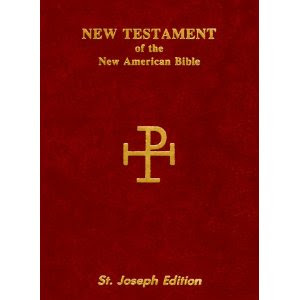 It has never been published in a complete Bible before, so you would think this would be the version of the NT that would be in the NABRE. Yet so far, it seems like it won't. WHY? Does someone else own the copyright to the Liturgical NT preventing it from being published as part of the NABRE? This also brings up that, maybe the newly revised OT will NOT follow LA, either. Like the 86 NT, it will only follow those 86 NT guidelines. If the OT does follow LA, then it will be a little unbalanced if the non-LA 86 NT is used. I was at a used bookstore yesterday and I found a 1970 NAB family Bible in excellent condition. I don't think it was ever really used, the pages inside are still sticking together (like with brand new Bibles). I really like reading from it. For one, the O.T., the N.T. and the Psalms are translated around the same time and the Bible is much more consistent in translation than our current NAB (O.T.-1970, N.T.-1986 and the Psalms-1991). The Catholic Family Bibles have a lot of Catholic devotions, prayers, dictionary and pictures included. When you read from it you really know you are reading from a Catholic Bible. I also really like the 1970 Psalms over the 1991 version. It would be interesting to do a comparison of the NAB and Liturgian Authenticam. While it is true the current NAB NT heard at Mass has been adapted, but to be honest only in some selected places. There are some things that LA calls for, like the 'Amen, Amen, sayings, which only the NAB has. This is interesting and probably deserves a post all it's own. Yes the original Psalms are far superior to the current one. Hoping the re-revised Psalms won't let us down. It would be best if the NAB NT would be revised to conform to what is found in the lectionary each Sunday -- it really would be helpful to have an edition of the Bible that conformed to what is used in the liturgy. That said, I like the Revised NAB NT quite a bit. It reads well. The notes and introductions I think privilege modern scholarship a little more than they should relative to the Church's traditional approach to the Bible, but I think that the approach used is still within the mainstream of how Catholic scholars read the Bible. One thing that I would definitely change if I could is the NAB NT's way of rendering Holy Spirit -- "holy Spirit." That just doesn't look right, and doesn't comport with the standard rendering of that term. It might be a justifiable rendering of the Greek, but it just isn't an appropriate rendering for an official Catholic translation of the Bible. IMHO.